SREBRENICA, Potocari, Bosnia and Herzegovina - JUNE 19th: Flying above the graves of murdered men and young boys in Potocari, Srebrenica, on June 19, 2016 in Potočari, Bosnia&Herzegovina. SREBRENICA, Potocari, Bosnia and Herzegovina - JUNE 19th: Memorial center in Potocari, a woman looking to the panels with the names of the murdered men and boys of Srebrenica, on June 19, 2016 in Potočari, Bosnia&Herzegovina. SREBRENICA, Potocari, Bosnia and Herzegovina - JUNE 19th: Memorial center in Potocari, the shot is moving towards the panel with the names of the murdered men and boys of Srebrenica, on June 19, 2016 in Potočari, Bosnia&Herzegovina. SREBRENICA, Potocari, Bosnia and Herzegovina - JUNE 19th: Memorial center in Potocari, the panels with the names of the murdered men and boys of Srebrenica, on June 19, 2016 in Potočari, Bosnia&Herzegovina. SREBRENICA, Potocari, Bosnia and Herzegovina - JUNE 19th: The memorial center in Potocari, the shot is rotating from above the ground, on June 19, 2016 in Potočari, Bosnia&Herzegovina. SREBRENICA, Potocari, Bosnia and Herzegovina - JUNE 19th: Memorial center in Potocari, a high angle shot moving from above the memorial center to the ground, on June 19, 2016 in Potočari, Bosnia&Herzegovina. SREBRENICA, Potocari, Bosnia and Herzegovina - JUNE 19th: Memorial center in Potocari, the shot is moving showing the panel with the names of the murdered men and boys of Srebrenica, on June 19, 2016 in Potočari, Bosnia&Herzegovina. SREBRENICA, Potocari, Bosnia and Herzegovina - JUNE 19th: Memorial center in Potocari, a high angle shot moving from above the memorial center, on June 19, 2016 in Potočari, Bosnia&Herzegovina. SREBRENICA, Potocari, Bosnia and Herzegovina - JUNE 19th: Memorial center in Potocari, the shot is moving in a half circle showing the graves of the murdered men and boys of Srebrenica, on June 19, 2016 in Potočari, Bosnia&Herzegovina. SREBRENICA, Potocari, Bosnia and Herzegovina - JUNE 19th: Memorial center in Potocari, the shot is moving showing the graves of the murdered men and boys of Srebrenica, on June 19, 2016 in Potočari, Bosnia&Herzegovina. 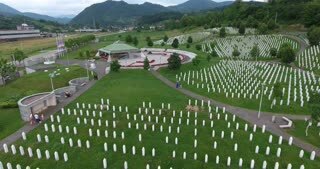 SREBRENICA, Potocari, Bosnia and Herzegovina - JUNE 19th: Memorial center in Potocari, a high angle shot moving from above the memorial center to the ground-time lapse, on June 19, 2016 in Potočari, Bosnia&Herzegovina.